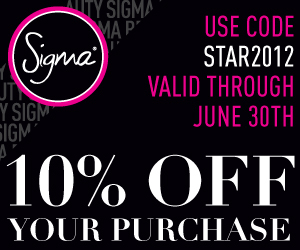 Sigma Beauty Affiliate Program: Exclusive Affiliate Discount Code! We are excited to share an exclusive affiliate discount code with you! 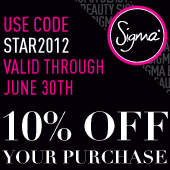 The code STAR2012 will be valid from June 1 - June 30 for 10% of your entire purchase! To easily share the discount code with your followers, simply save the banner image to your computer, upload it to your blog as a picture and insert your affiliate link as the URL. The key to success with this money-making opportunity is to always share the 10% off code with your affiliate link. 10% off is great incentive for your followers to purchase, so share the discount code in your YouTube info box, Twitter, blog and Facebook page! Sur mon blog et Twitter ! Merci Sigma !!!! Hi Anya! Please contact annie@sigmabeauty.com for assistance! Thank you! Hi i'm new to this, received an email which lead me to this page... how do I get the code for the banner?? eu já coloquei no blog!!! Shared on my blog and facebook page...thank you! At this time we are no longer sending products through the Incentive Program for review and giveaway. If you have any additional questions, please contact affiliate@sigmabeauty.com! The Tax ID/SSN is only needed for US citizens. If you are not a US citizen or permanent resident, you can enter any number in that spot (123 will work!). Please contact affiliate@sigmabeauty.com with any additional questions! Gostaria de bannes em português, como faço? Hi! We do not have these banners available in Portuguese at this time. You can contact affiliate@sigmabeauty.com for additional banners in Portuguese. Thanks! you do not deliver more kits to the affiliates? At this time we are no longer sending products to affiliates through the Incentive Program. However, active affiliates who are earning money will benefit not only from their 10% commission, but also through our Rewards Program: http://sigmabeautyaffiliates.blogspot.com/2012/05/update-rewards-program-bonuses.html. What is the freegift with june purchases 2012? It is the mini E25 blending brush! shared!! :) more power Sigma! When does the new coupon code become available for July?